If you happened to read last Sunday’s post, you might remember that we have a house guest at the Mortroski Mid-century. Or rather, that we had a house guest. You see, Gidget found a great home. A home with other dogs to play with, soft couches to sleep on, yummy food, lots of toys, walks twice a day, and a nice lady named Tracy who visits while the people are at work and enjoys administering belly rubs, throwing the ball, and giving out treats. If you haven’t figured it out yet, we have a new 40 pound family member. Stella, aka Gidget, is staying. Yes, Fransi, Simone, and Joy, you called it days ago. No, it didn’t happen at the same time as the name change on Sunday evening. Actually, Bruce and I talked about it on Tuesday night, after dinner. Why so soon? Because she was so damn easy and had fit in so well, so fast. The prize you get for calling it are all the free Gidget kisses and tail wags you could want. You’ll just have to come to the Mortroski Mid-century for their administration. And you don’t have to hurry, because most likely she’ll be here for a good long while (touch wood). Remember she’s probably somewhere around one, give or take a few months. So Gidget is a foster fail. Or really, Bruce and I are failures. We succumbed to a little street dog’s swift adaptation to life in a house. To playing joyfully with toys. To running laps with George and Godiva. To learning how to sit in less than 2 days. To crying when we left. To barking in happiness when we returned. To ears that detected Bruce’s truck as it was driving down the alley to our driveway. To knowing that the garage door going up meant another human was coming home. To barking at bicycles and baby carriages, but not other dogs. To “getting” how to walk on a leash just by following Guinness’ lead. To charming us out of bits of food. To charming George out of most of his food. To snuggles and kisses. To coffee table clearing tail wags. To razor-sharp puppy teeth. To sheer cuteness. To making herself right at home. In short, we were soft touches, something that I know our friends and family are completely shocked about. It is completely our faults. We were weak. And Gidget knew it. So did the Gs. When we made the leap from two dogs to three, I worried that we were upsetting the balance of our little pack. Guinness and Godiva were happy together, Mr. Laid Back with Ms. Sensitivity. But George’s goofiness and puppy-like playfulness gave Godiva a friend to romp with so that Guinness could have more naps. This week, Gidget gave the Gs a purpose. Their mission: to turn a little street dog into a perfect member of the household so that they’d have another pack member. And they all gave it their all. From Guinness administering discipline to George showing her that sitting even when not asked usually ensures food when the humans are cooking. To Godiva reminding her that she is the alpha and must be shown respect. And all 3Gs played and played and played to wear the little street dog out so that she would be calm for walks and ready to turn in at bedtime. 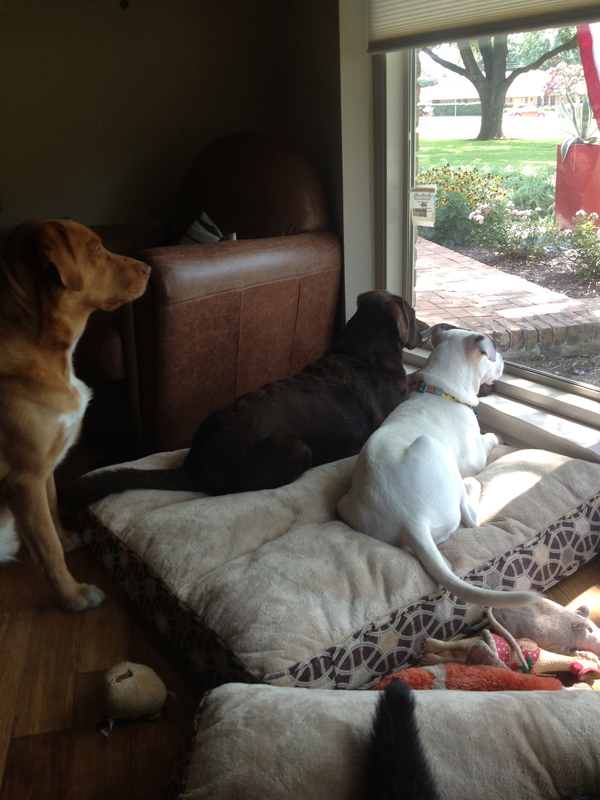 Yes, we fully understand the folly of having four dogs. Four mouths to feed. Four times the vet bills. Four times the heartworm medication. Four City of Dallas licenses to buy each year. Four as many baths to give. Four leashes to hold. 16 feet to pedicure. More doo-doo to pick up. And lord knows how many toys that George, Gidget and Godiva will go through now. We’ve talked about and thought about all of those things. And we are fortunate that our budget allows us to bring her into our home permanently. Yes, I said budget because sometimes when people think about pets, they only think with their hearts. That may be the very thing that landed Gidget on the street—someone who loved the cute puppy with all of his or her heart, but couldn’t afford to feed her or take care of her properly (she was not spayed). If we could not afford to adopt her and care for her properly, we would still be fostering and hoping like crazy that she’d find a great home. The rewards will be priceless. One more four-legged friend that will greet us with tail wags and sweet doggie kisses, not just on the most craptastic of days, but every day. One more four-legged friend who will hang out in the garden. One more four-legged friend to snuggle with on the couch. One more four-legged friend who will make us go for yet another walk on those days when the weather is rainy/cold/hot/buggy and we really don’t want to walk. Still, our days of fostering are not over. Over brunch with some of the Duck Team 6 crew, as we celebrated our upgrade to 4G, we let them know we’d be available for emergency fostering. One Duck Team 6 member who found her said that after meeting us last Sunday and seeing how happy Gidget was with the Gs, she was wishing for a foster failure. Maybe we all need to wish a little harder for the things we want to happen. For more information, to volunteer, to foster, or to donate to help get Dallas’ street dogs like Gidget off the street, visit Duck Team 6. This entry was posted in So and tagged 3G Network, adopting a pet, adopting a rescue dog, bruce, Dallas, dogs, Duck Team 6, expenses and budgeting for a dog, fostering, fransi weinstein, George, Gidget, Godiva, Guinness, Julie Petroski, Mortroski Midcentury, Texas, weather. Bookmark the permalink. Uh huh. You’re the best! Congratulations! Gidget went through a lot to get to you guys but she sure sounds happy to have made it. Thank you. She’s going to be a great addition to the family. She truly does look right at home! I love seeing her in your pictures, can’t wait to hear about her antics and am excited for you both to have found each other! YIPPEE, YIPPEE, YIPPIE, YIPPEE !!!! OMG you have no idea how happy I am right now. The thought of that sweet thing having to go off with some other family was just breaking my heart. Never was a baby meant to live with a group of humans and other babies like she was meant to live with all of you. The Gs would have been devastated, I am sure. As would you and Bruce. She just moved in and became family immediately. You saved her little life and she knows it. Failure? I don’t think so. Never has a failure been more of a success!!! Honestly I could just hug all of you. And I love this blog post. So sweet and loving and caring you made me cry. Oh I am so excited I could just SCREAM!!!! Happy, happy, happy! You and Bruce are my heros. Really and truly. I know you’ll spoil her and love her, just like you do the others. That’s why I was hoping she could stay. I know. I MUST come and visit and I will. Promise. She (and the rest of us) would love that. I echo everything Fransi has so eloquently expressed. I, was also praying for this to “fail.” I knew you and Bruce would move on if you had too, but it pleased me to no end that Gidget was doing so well with your existing pack and that they so easily and warmly welcomed her. I was really afraid George in particular might seriously miss her. So, I too, feel a little teary. I’m a sucker for a happy ending. (And, I sure could use one too; George and I just came home from seeing Blue Jasmine. Oy.) Can’t wait for more updates. If I can find any champagne in the house, we will be toasting you all tonight and sending our very best wishes to your newly expanded family. Laura, I hope you and George do have some champagne at home for a little happy celebration. If you don’t, when you come to Dallas to meet her, we’ll have some then. She’s a lovely dog and we are so happy to give her the home she deserves. What a nice entry – and she sure did luck out! 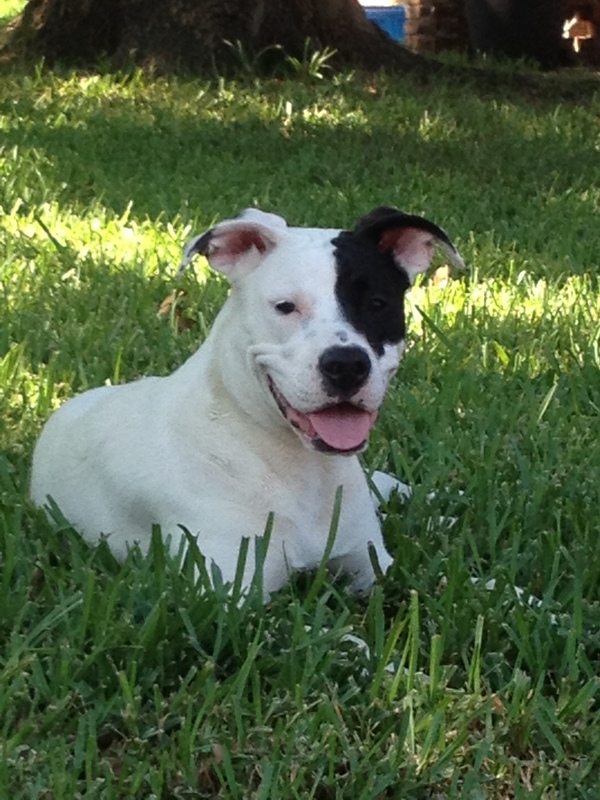 Thanks for improving the dog scene in Dallas so wonderfully by making a difference for this one lucky little dog. We are happy that she came into our lives. Thank you for reading the post. Another happy ending – I never doubted it – clever dog. Clever little thing worked her magic well.